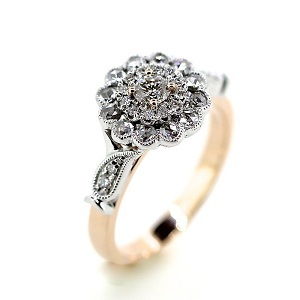 There are several reasons why you may want to have one of your rings resized. Whatever the reason may be, there are a few factors to consider before you go ahead; different methods and times when it is not recommended to resize your piece. Even the smallest fluctuation in weight can cause your finger size to change. Just be sure that you want to change your ring size before you go ahead with it. It’s common to be gifted a ring that is the wrong size – after all, how is your friend/partner supposed to know your finger size? Wanting to wear a ring on a different finger. There are two main methods to resize a ring larger, stretching or adding a bridge (bridging). Stretching is rather self explanatory, the jeweller will heat up the metal and proceed to stretch the ring. This should only be done if you want your ring around ½ size bigger, stretching too much can cause your band to become weaker as the band may become thinner. If you need your ring any larger than ½ size, bridging should be used. This is where the band is cut, and a ‘bridge’ of the same material is welded/soldered into the space to achieve your desired size. If you are looking to make your ring smaller there are also two methods commonly used, compacting and shrinking. Similar to stretching, compacting requires no welding, soldering or cutting. Shrinking is when some of the band is removed and the ring is then soldered/welded back together. Can Any Ring be Resized? Resizing your jewellery can be somewhat risky if you have an ornate ring or a eternity ring with a channel setting with a lot of precious stones in it. If you have engraving or some sort of ornate design removing some of the ring or adding a piece can change the design or become more expensive to resize as the design will need to be re-done. 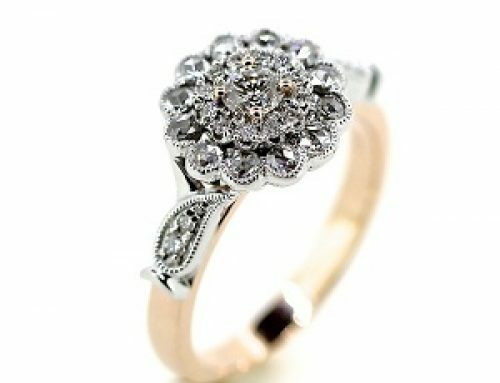 If you have a channel set ring the resizing could compromise the integrity of the setting with the stones. The same can be said for the prongs on the head of the ring, these may stretch or shrink depending on the procedure. Ensure that when you get your ring back from being resized you check the stone and that it’s not loose. Rings that have invisible tension settings in them are risky to resize too as this can compromise the tensile strength in them. Lastly ensure that you have the correct ring size before going ahead with resizing. You can have a look at this ring sizing chart here – however your jeweller will be able to size you up. 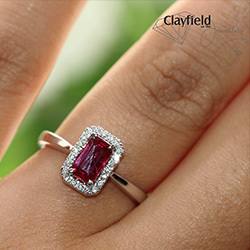 If you’re in the North Brisbane, pop into Clayfields and we can help you out with all of your jewellery needs! Contact us here.